Neither Magento 2 nor Magento 1 provide the ability to enrich product pages with additional information, but you can easily get the missing functionality by installing third-party modules. 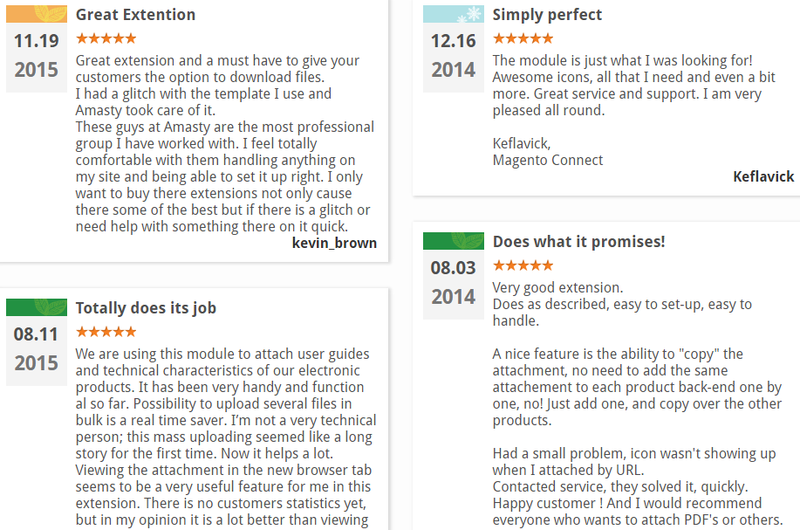 We have already described File Downloads & Product Attachments by Mageworx, and below you will find our review of Amasty Product Attachments for Magento 2 and 1. 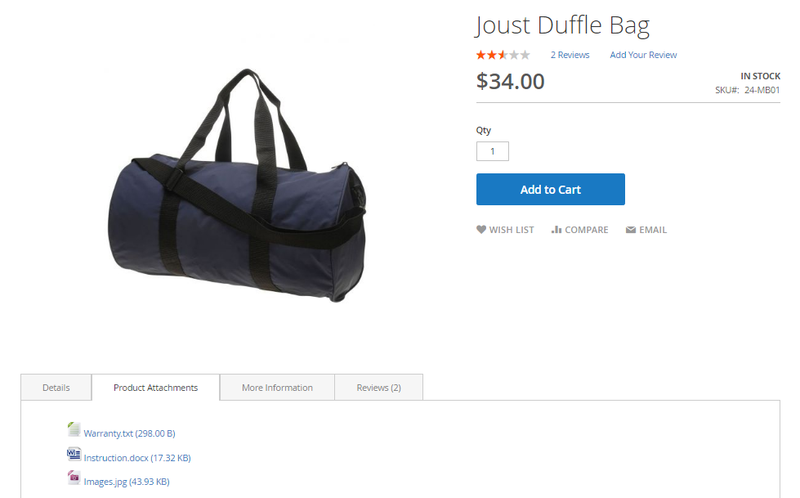 If you have to deal with complex products in your ecommerce business, then it is critical to provide your buyers with maximally detailed descriptions. It will help them make a correct purchase decision and show how attentive to customers you are. 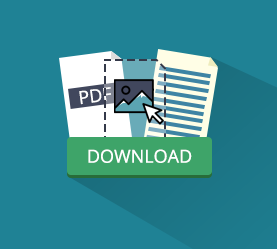 The Amasty Product Attachments enhances product pages with a new block that can contain various documents, guides, licenses, certificates, and other files. Formats supported by the Magento 2 file upload extension are: pdf; txt; docx; pptx; xlsx; flash; mp3; avi; zip; jpg; ini; readme; and more. The Magento 2 product attachments extension lets you use predefined icons (alternatively, you can upload your own), as well as upload an unlimited number of different files types, so your product pages will be as informative as possible. For simplifying the admin routine easier, the Amasty Product Attachments extension provides the ability to upload files by dragging and dropping them to a grid. As a Magento owner or admin, you can keep track of all downloads. As we have already mentioned, the Magento 2 Product Attachments extension by Amasty allows uploading as many files to each product page as you need. Besides, you can save much time uploading them right from the product grid. Bulk upload is also possible, but it requires attachments to be uploaded via FTP, and then a CSV file has to be generated to make uploaded documents match corresponding products. Also, you can attach files to all products within a category. Due to the ‘Mass copy’ action, it is possible to copy particular attachments to multiple products in a matter of seconds. 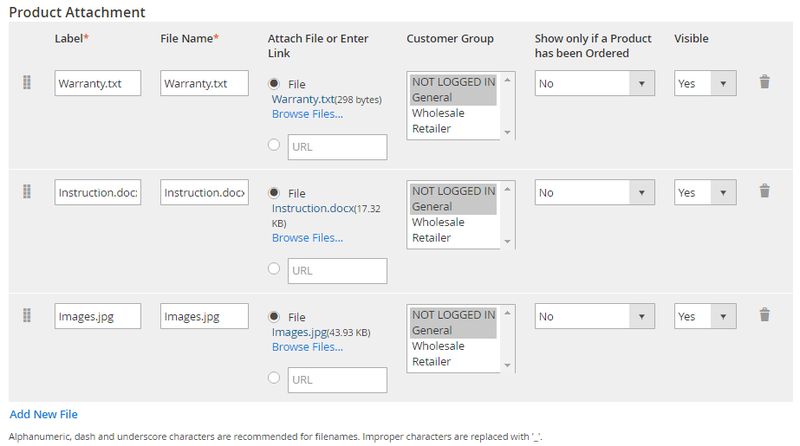 You only have to specify a product’s ID from which the files should be copied and select items to which these files will be added. Furthermore, it is possible to manage files visibility enabling or disabling files display and showing or hiding them depending on customer groups. Customizable file names are also among extension’s features. 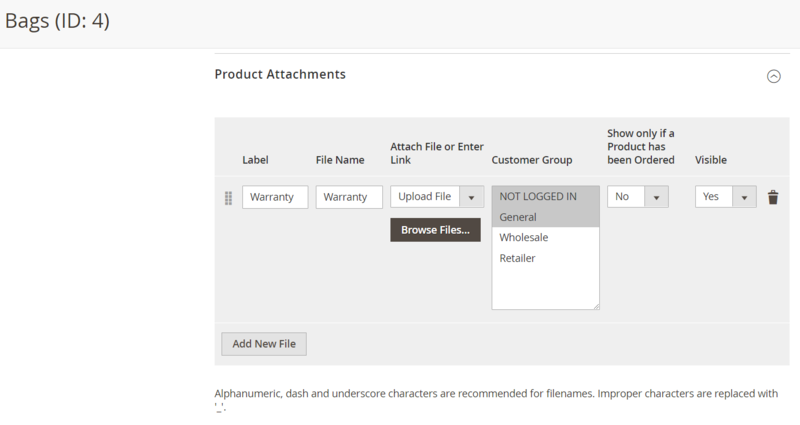 The Magento 2 product attachments module lets you specify two names for one attachment – for internal and external use. Additionally, you can leave names as they are. As for customers, you can provide them with the ability to open attachments right in a browser. Each new attachment is opened in a new window. It is also possible to regulate files display for different store views providing buyers from different countries with the information they can understand. Also, you can set the sorting priority to display the most important documents first. For making your attachments more catchy, the Magento 2 product attachments extension offers an opportunity to enhance different file types with various icons. As a result, customers will see which file format they are going to open. Alternatively, it is possible to use predefined icons. There are 8 ready-made images available within the module. As for reports, with Amasty Product Attachments you will be able to keep track of file downloads. The reports display such useful information as product ID and name, file name, and the date of download. There is also the possibility to get separate reports for each store view. As you can see below, the Catalog grid gets a new column – Upload Attachment. Besides, there are two new mass actions provided by the Magento 2 product attachments extension: Remove All Attachments and Copy Attachments. To edit attachments of each product, go to the product info page and find the Product Attachments tab under Advanced Settings. Here you can modify Label and File Name, attach a new file or enter an appropriate link, choose customer groups for which to display the attachment, enable/disable “Show only if a Product has been Ordered” feature, and make the attachment visible or hide it. In the same way, you can attach files to all products within a specific category. Next, go to Products -> Amasty Product Attachments -> Icon Management. Here, the Magento 2 file upload extension allows editing already existing icons or adding new ones. To add a new icon, upload a file, specify attachment type to display the icon with, and set its status (enabled/disabled). Products -> Amasty Product Attachments -> Mass File Import takes you to the interface where you can upload attachment files in bulk. Core requirements of the Magento 2 product attachments extension are described there as well. 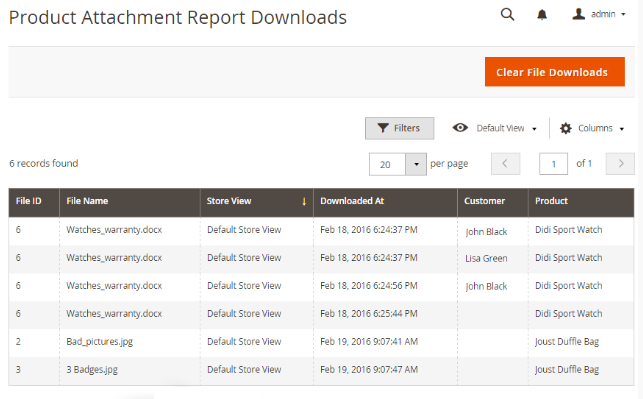 As for reports provided by the Magento 2 file attachments extension, they are available under Reports -> Amasty Product Attachments -> Downloads. The grid with downloads illustrates such data as file ID, file name, store view, time and date of download, customer, and product. The Magento 2 product attachments extension configuration page is available under Stores -> Settings -> Configuration -> Amasty Extensions -> Product Attachment. It lets you configure attachment block for the backend. Here you enable or disable the extension, choose customer groups to display the block and whether to display the block only if a product has been ordered, as well as configure other settings (see image below). Other two sections of the Magento 2 file upload extension let you specify a directory for uploaded attachments and enable attachments to be opened in a new browser window. New feature: upload of attachments for all products in a category. ‘Alt’ tag for icons was added. A possibility to inject attachments block into any position on a product page with PHP code was added. New backend page with the list of all attachments was added. API Support was added: now it is possible to create, update, delete, and do more actions with attachments via API. As you can see, Amasty Product Attachments for Magento 2 and 1 is a handy tool that adds some vital but missing features. 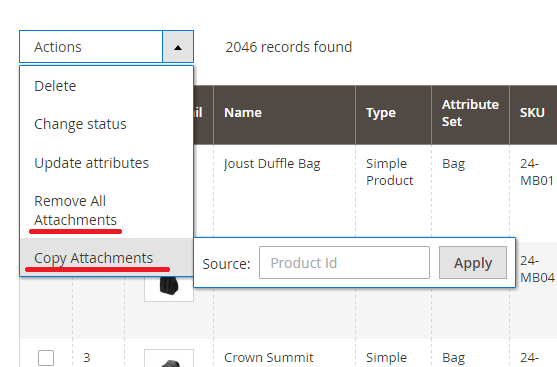 If you want to provide your customers with additional information about your products, the Magento 2 product attachments extension offers one of the best possible ways to do so. As for price, you can purchase Amasty Product Attachments for Magento 2 for $139, while its predecessor costs just $79.